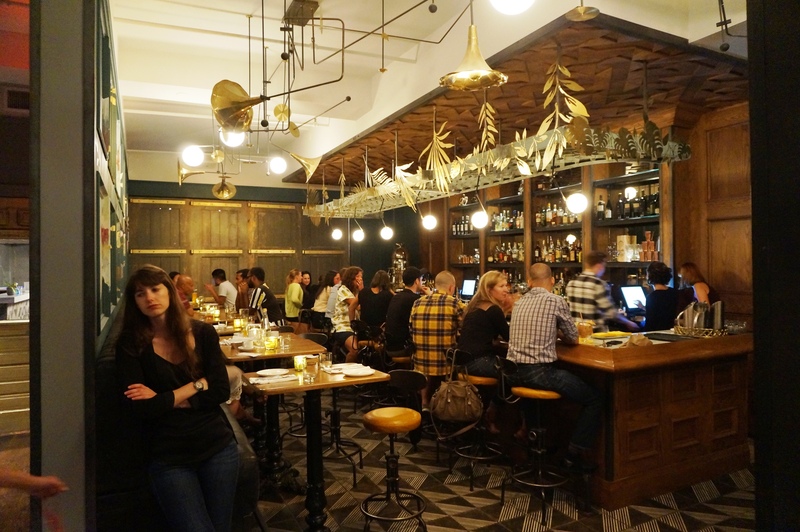 Recently opened on Queen St just west of Dufferin, Miss Things is one of the new “it” places of summer. 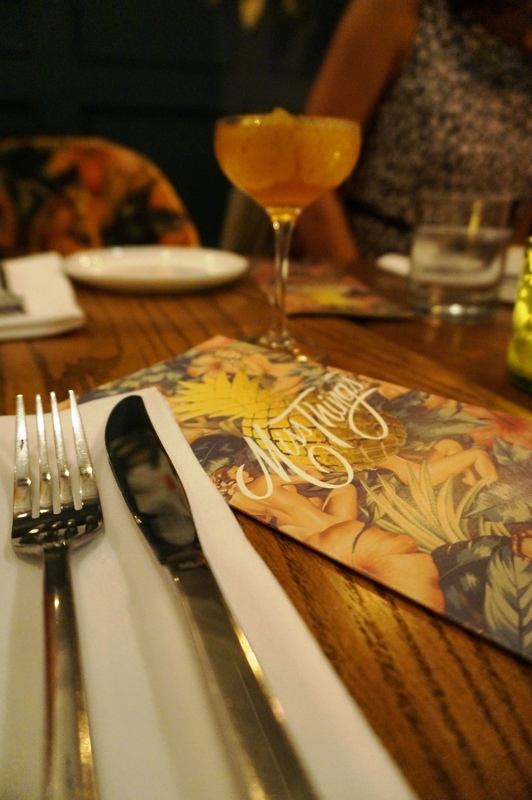 Walking in you’re greeted by an elegant and chic French influenced wood grain bar coupled with a large mural of flowers transporting you to a somewhat tropical island, safe to say its ambiance reflects the menu, classic dishes with a pan-Asian/tropical influence. We got quite carried away with talks of food, so much so that we hadn’t nailed down our order when our waitress came around. Given a couple more minutes to regroup we focused and classically over ordered. 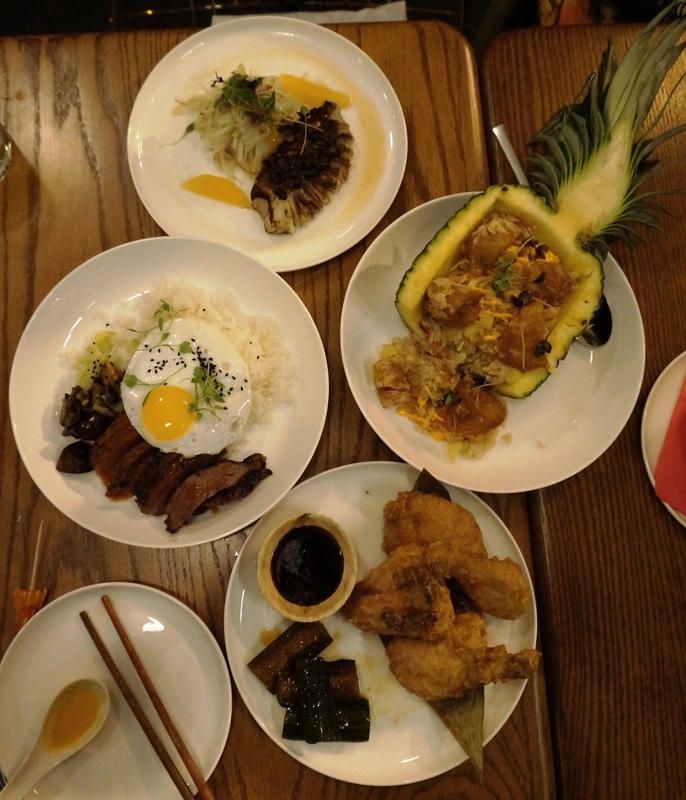 From start to finish we ordered the Lobster Bisque Ramen; the grilled squid; the fried chicken (of course), the Loco Moco and their signature, the pineapple fried rice. It didn’t take long before the food started hitting the table; first out the lobster bisque ramen, it was tiny, a kids serving size, but then again lobster is about flavour not portion size. 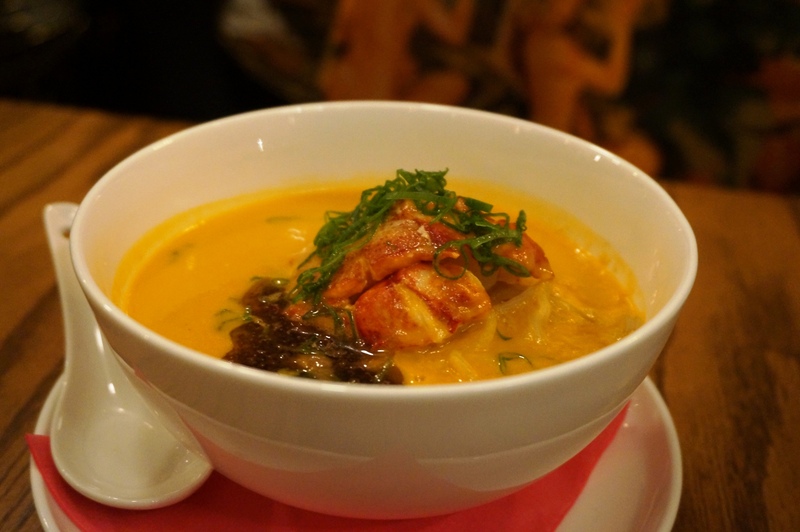 Unfortunately the flavour of this particular bisque lacked any sort of depth and was completely lack lustered, my positives mostly come from the amount of lobster in the small bowl. 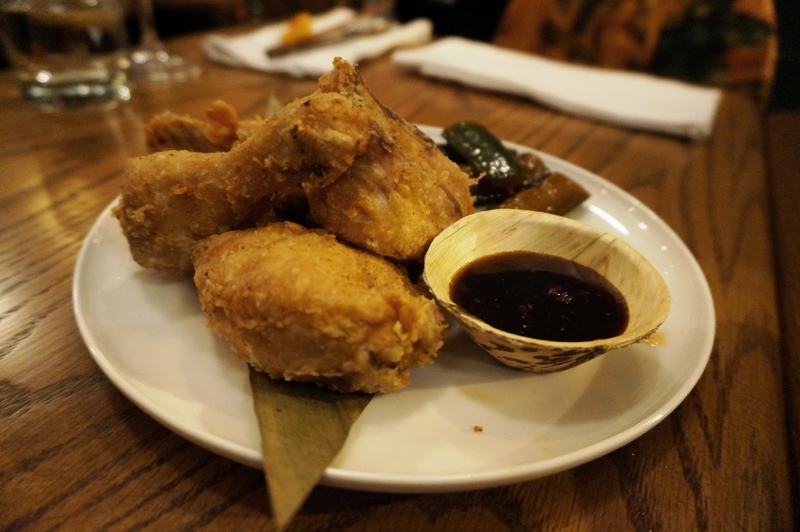 Their Fried chicken, a spice dredged chicken served with a sweet Szechuan style dipping sauce and pickles was out next, reminiscent of an old school KFC coating, more about the flavour than the crunch it was an interesting take. The spices prominent but not over powering and their sauce was magnificent; a true balance of flavours, next time I order the fried chicken I want it tossed in the sauce because it took a good fried chicken to a great fried chicken. The only thing I didn’t like on the plate was the pickles, trying to maintain the pan-Asian concept they were soaked in various sauces which gave it a Kung pao chicken-esque flavour which didn’t match the rest of the dish. 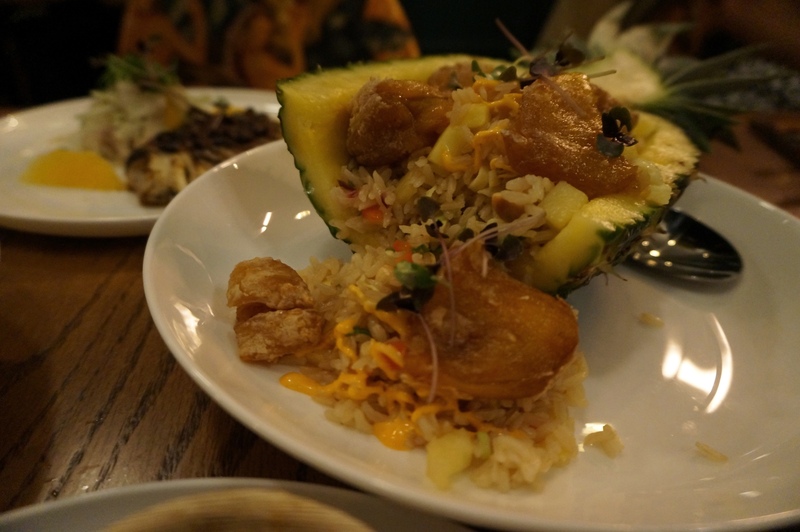 The last three dishes came out together, I first reached for a hollowed out pineapple filled with fried rice and topped with pieces of what turned out to be jackfruit; I had thought we had ordered pork however my friend made a mistake when ordering. I was not at all upset about the jackfruit, it was made superbly and my only problem with the whole combination was the exceedingly predominant sugariness of both the jackfruit and pineapple together. 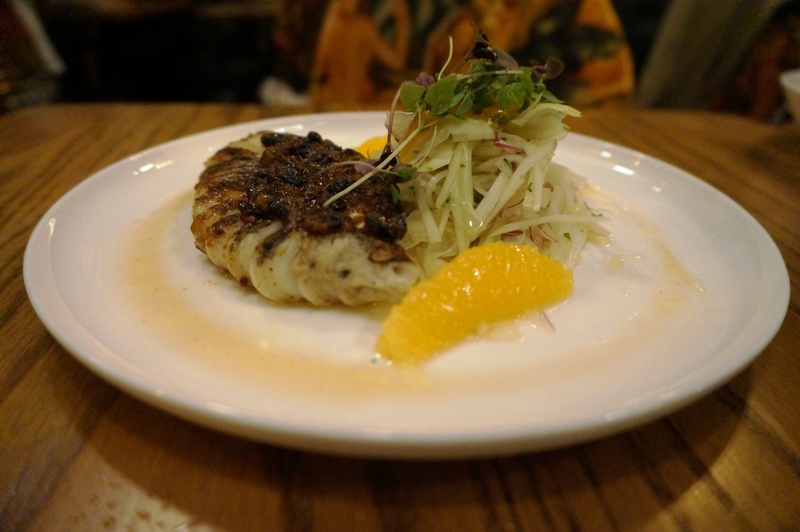 Next I tried the grilled squid, it was topped with spicy black bean and served with a green papaya and fennel slaw then finished with candied oranges. It was for me, the standout dish in terms of everything; the cooking was exquisite, the concept of sweet, tart and spicy altogether on a plate with the delicate squid was transcendent of simple but delightful cooking. Last was the Loco Moco and unfortunately was another disappointment, if not the most disappointing. The egg and mushrooms were quite simple and the rice, while flavourful was simply coconut rice. Finally the steak, a very overcooked flank served with their homemade A1 sauce which lent a tangy and bold flavour but on its own the steak was as flavourful as cardboard. Regrettably my meal at miss things was hit and miss; nevertheless I’ll be going back for the fried rice with pork and jackfruit together, I think the combination will be dynamite. 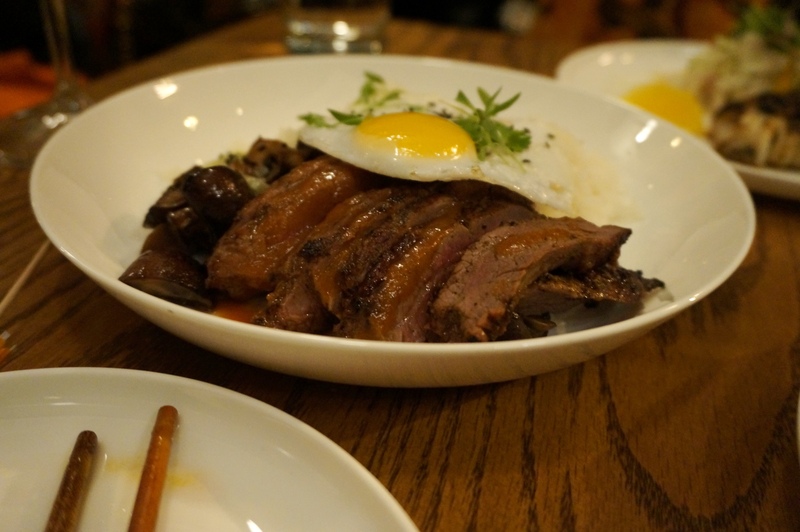 Posted on September 24, 2015 October 13, 2015 by AdrielPosted in Fried Chicken, MISteaks, TorontoTagged Flank, fried chicken, fried rice, lobster, parkdale, squid, Steaks, Toronto.